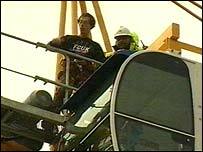 A man who climbed 120 feet (36 metres) to the top of a crane in Exeter has ended his protest on its third day. Jolly Stanesby, a member of Fathers 4 Justice, staged his protest to draw attention to the issue of men who say they have been denied access to their children. He climbed the crane at the site of the new Crown Court at about 0700 BST on Wednesday. He was questioned by police and then released. Mr Stanesby had said he would stay on the structure for a week and had enough provisions to stay longer. He said he was carrying out his protest to highlight child-related access issues. During his protest, he told reporters he was a registered child-minder with no criminal record but was not permitted sufficient access to his daughter. He was taken to Exeter's Heavitree Road police station for questioning and then released without charge. "Going to the top to make his point..."